FindItMore | The state of Rajasthan is every visitor’s dream destination. One who loves to dig into the captivating past; one who wishes to live in the soil of origination; one who loves to be pampered; one who admires the beauty of historical monuments; one who is driven by authenticity; one who dreams of living a luxurious trip; one who think of the acts of Realness and Royalty – if any of the above listed dreams and wishes match with your self-created list of desires then run into the arms of the Princely state known as Rajasthan [the land of royals – the land of Kings]. The state of Rajasthan, which holds a major position and huge recognition for housing the Inhospitable Great Indian Desert (Thar Desert) is equally known for the acts of hospitality that run in every corner of this wide-spread state, the pride spot of Northern India. Talking about hospitality; the city of Jaipur is thoroughly painted in the shade of it i.e. Pink; hence this city is nicknamed as the Pink city. It’s the capital as well as the largest city of Rajasthan, dotted with some of the major creations depicting excellence. One can involve in numerous activities the moment they enter into the province of this praiseworthy state [do not look back – just head forward]. Camel Ride, Jeep-Safari, Overnight Camping, Traditional dance and Music Performances, Photography, Videography, Hot-air Ballooning, Zip-Lining, Exploring the Hathi Gaon, Tasting the products made up of Camel’s milk, Visiting the rarely found Brahma Temple, Exploring the exceptional village zones – living the life of basics etc. The state of Rajasthan is packed with wondrous destinations and yes, do not forget or miss on exploring the only hill of this phenomenal state – Mount Abu. Find yourself meandering in the Thar Desert; listening to the strong sound created by the speedy winds; roll down a dune and feel the essence of yellowish sand. 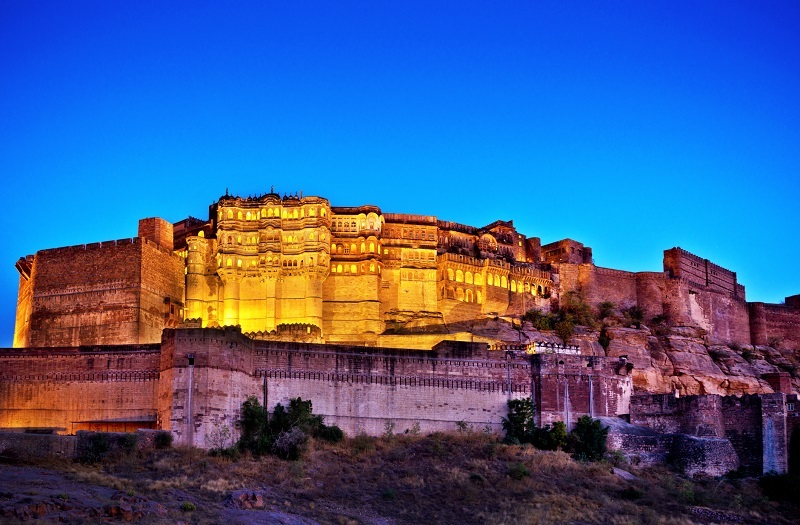 The Amber Fort is situated at Amer [Part of Jaipur] in the enthralling state of Rajasthan. This place of greatness is located high on a hill; it’s the prime tourist attraction in Jaipur. It exhibits the artistic Hindu style elements; keen travelers belonging to various parts of the country and world input huge amount of commitment to place their presence at this eminence absorbed point of attraction. If you haven’t yet explored the Amber Fort; plan a trip any time soon and witness the phenomenal creation of past. Exhibits an exemplary combination of numerous architectures; Badami Chalukya architecture, Mughal architecture and Western Chalukya architecture. This wide palace complex includes the Mubarak Mahal and Chandra Mahal Palaces and several other eminent buildings. The City Palace was constructed between 1729 and 1732, initially by the ruler of Amber [Sawai Jai Singh Second]. The impressive and extraordinary Rajput architecture [made up of Red and pink Sandstone]. The Hawa Mahal is famously addressed as the “Palace of Wheels” or the “Palace of the Breeze”. The Mahal sits on the brim of the opulent city Palace in the city of Jaipur. A relaxing destination, located in the Lake city of Udaipur; it’s an imposing artificial freshwater lake surrounded by the scenic views. This lake is adorned with four Islands – Jag Niwas, Arsi Vilas, Jag Mandir and Mohan Mandir. Visit this refreshing destination and allow your heart to smile with happiness. The Key attraction of Jodhpur, also addressed as the Mehran Fort. It’s one of the largest Forts residing with immense pride in nation India. The Mehrangarh Fort was constructed around 1460 by Rao Jodha; it’s located at an elevation of 410 feet above the city and is encircled by impressive thick walls. This fort is adorned with seven imposing gates; ornamented with exceptional intricate carvings; blessed with extensive courtyards etc. It also owns a Museum, one of the most well-stocked museums in Rajasthan. Visit this place of amusement with your Rajasthan tour. The Kumbhalgarh fort breathes in immense pride and recognition as it owns a wall that extends up to 36 kilometres making it the second longest wall in the World after the exemplary Great Wall of China. It’s a Mewar Fortress situated on the Westerly range of Aravalli Hills in the Rajsamand district of the historically glamorous state of Rajasthan. It’s one of UNESCO declared Hill-forts of Rajasthan [World Heritage Site]; constructed during the days of the 15th century by Rana Kumbha. Kumbhalgarh is the birth location of the great King and Warrior of Mewar [Maharana Pratap]. Place your visit at this noteworthy destination and sing the song of excitement and joyousness. A wide piece of land devoted to the rich and expansive collection of striking species of flora and fauna; this National Park is well-known for preserving the numbers of Bengal Tiger. The Ranthambore National Park was declared one of the Project Tiger reserves in the year 1973. It’s situated in an expansive zone of Sawai Madhopur in the state of Rajasthan. You can involve in an activity called as jeep safari, do some photography and videography, spot some species rare to sight, explore the tricky jungle trails etc. Rajasthan is a multi-coloured state; place your visit and explore the magic of every tourist destination residing within its vicinity.